Sony Electronics announced its impending venture into the consumer OLED TV arena Wednesday, with the unveiling at CES 2017 of its Bravia High Dynamic Range (HDR) XBR-A1E TV series. 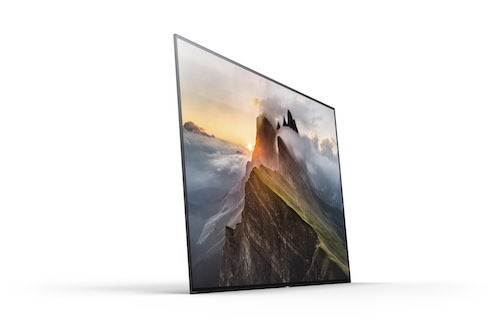 The series, which will support Dolby Vision’s HDR iteration as well, is to be available in 55-, 65- and 77-inch screen sizes, will be powered by Sony’s 4K HDR Processor X1 Extreme, and will feature a proprietary built-in audio technology – dubbed Acoustic Surface – that does not use a traditional audio delivery method; rather, as described by Sony Corp. president and CEO Kazuo Hirai, it takes advantage of OLED’s backlight-less structure. “Sound comes directly from the screen, vibrating the display to produce audio; there are no separate speakers on the outside or at the bottom of the TV,” Hirai explained. The company’s news release said this approach produces “a wide sound and image synchronization from all angles, even off to the sides.” It further states that by doing away with conventional speakers, it allows for a unique form factor with the stand being an easel rather than a beneath-the-TV design. Two prototypes of in-ear and behind-the-ear wireless noise-cancelling headphones. Hirai also noted the continuing success in the U.S. market of the PS4 PlayStation. He said 6.2 million units had sold through during the holiday season, and that 53.4 million sales had been realized worldwide altogether in the PS4’s four-year lifespan.